The 2012 Hyundai Genesis is set for a much-needed facelift, which this newly leaked photo reveals. Not long ago a photo was leaked online showing the newly restyled front end of the 2012 Hyundai Genesis Coupe. While that picture was kind of grainy, it still showed how Hyundai applied their "fluidic sculpture" styling language to their popular coupe. This new photo is of better quality and we like what see. 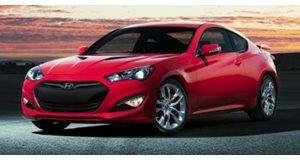 The first generation Genesis Coupe is a great car, but the one thing we were never thrilled with was its front end design. Overall, it was too conservative and it didn&apos;t match well with the car&apos;s desired ethos. The new front end strongly resembles that of the newly launched Veloster and it features new headlights and LED daytime running lights. In addition, there&apos;s a ventilated hood, restyled side mirrors, and an updated taillight design. More than likely, engine options will include an upgraded 2.0-liter four-cylinder and an updated 3.8-liter V6 that&apos;ll produce about 333hp and 291 lb-ft of torque. No word yet on when the facelifted 2012 Genesis Coupe will debut, but our best guess is that we&apos;ll be seeing it this January at the 2012 Detroit Auto Show.